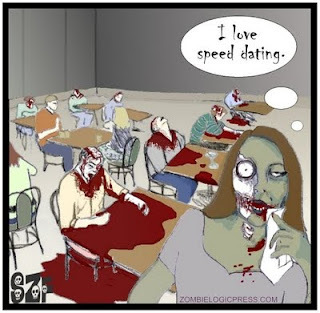 Single Zombie Female is the world's first and only feminist zombie webcomic. Written by Thomas L. Vaultonburg and illustrated by Jenny Mathews, Single Zombie Female follows the adventures of SZF as she searches for brains, love, and the perfect pair of skinny jeans in a post-Apocalyptic world full of zombies and construction workers. This episode is titled Speed Dating. February 10, 2013 update: I'm anxiously anticipating some more episodes of SZF, but life has been busy. Maybe an idea for a new episode will overtake me while I'm doing something mundane like separating the recycling. I think she still has a lot of work to do in the ongoing struggle for equality among the undead. Have I disabled hyperlinks? Also, people could just look over to the labels and find fine webcomics like Demoted and The Sofa King. I too am an aspiring blog blogger but I'm still new to everything. Do you have any tips for first-time blog writers? I'd genuinely appreciate it. Thank you for asking. Find things you legitimately enjoy and write about them. Try to find aspects of things no one else has written about. Write a lot. Just have fun.